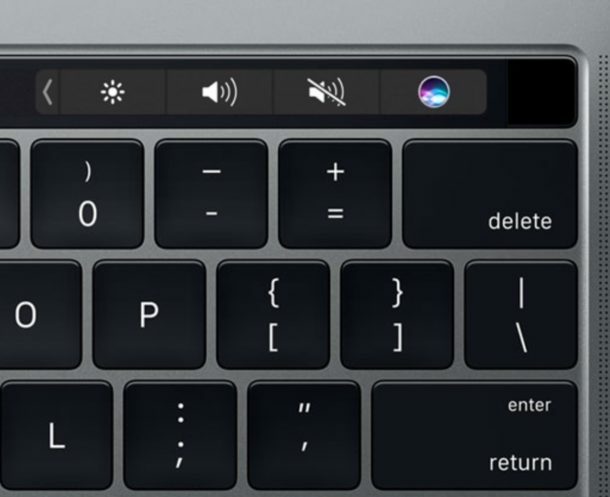 The Touch Bar on MacBook Pro changes dynamically depending on what application is open and what action is going on within Mac OS. Or at least, that’s what’s supposed to happen. Rarely, the Touch Bar stops working, will get stuck and become unresponsive, maybe even display an erroneous button, or show a blank button that doesn’t do anything. Typically the Touch Bar gets itself back in working order once the troubled application in question becomes responsive, exited, or the app is force quit, but sometimes you may need to manually force the Touch Bar to refresh and reload. We’ll show you how to relaunch Touch Bar on a Mac, as well as how to target just the Control Strip portion of Touch Bar to force that to refresh. Remember, the Touch Bar is the entire touchable strip across the top of new model MacBook Pro keyboards, whereas Control Strip is just the far right portion of the Touch Bar display. You can target both, or either to manually force them to refresh. To manually force just the Control Strip portion of Touch Bar on Mac OS to reload, you will turn to the command line. Targeting just the Control Strip will usually resolve the mystery blank button issue. Forcing Touch Bar to refresh and reload may fix issues with either the Touch Bar or the Control Strip, or both, though sometimes you might need to reboot the entire Mac to resolve more stubborn issues if the Touch Bar is totally unresponsive. There is also “TouchBarUserDevice” along with “Touch Bar agent” and you can kill both of them. I recommend rebooting though. Maybe Apple will fix Sierra one day, but probably not since it’s in maintenance mode for Mac OS 10.13! I tried the above and although both executed fine. The touch bar didn’t refresh. How do you restart the touch bar without rebooting the computer? I went through all this and wasn’t able to resolve. Turned out to be a setting in Control Panel > Keyboard. It needs to be set to App Controls with Control Strip. User had accidentally changed it to Extended Control Strip without realising. Even Apple Support weren’t aware of this setting and we were going all kinds of other resets before I stumbled across it. I purchased my MacBook Pro with TouchBar on April 2017, and now the touch bar is not working properly. When I touch the emotion symbol the touch bar goes blank and non-responsive. Thats not normal. You should go to apple technicians to fix it or use your guarantee. Nah, that’s totally normal. I bought mine in 2016, and I have that issue periodically too. It’s just got some bugs in it. If you’re confused by where exactly to type the commands open the program Terminal which is located in the applications section in the utilities folder. Also, make SURE you write the command EXACTLY as it appears. It wasn’t working for me either, but then I capitalized the same letters you did and then it worked! My touch bar was frozen on the right side and would not function at all over there. I simply typed in the command killall ControlStrip (WITH THE capital C and S), hit the enter key, and it just unfroze and is working perfectly now! P.S. Thank you sooooo much for creating this, seriously. lol I had been trying to figure out what was wrong for hours. I was about to come to the conclusion that the lil bit of water I got on it just broke it or something. lol. Yes! The same thing happened to me a few drops of water spilled on the control strip and it completely froze for a day and I thought I broke it. This article was a life saver! Touch bar agent isn’t showing in the activity monitor so i cant terminate it. No such animal! It’s called “Touch Bar Server”! If you can’t scroll sound and/or brightness with your touchbar anymore, perhaps you have made recent changes to your settings. Go to settings>accessibility>minimize/>deactivate the ”activate zoom with the touchbar”. That solved the problem for me!!! Thank you so much! your solution helped me so much !!!! I tried all of the above, but nothing works. With the commands, terminal tells me that ´´there is no matching processes´´. Yeah I’ve had my MacBook Pro for a little over a year now and the last few months my Touch Bar will go completely blank. still works though, if a randomly tap on the bar I will hit the volume and brightness buttons. It went out for like 3 months (after an update), then started working for a couple months. my Mac just had another update and it stopped working again! This is so frustrating. Ive tried the above steps and didn’t work, but since typing this reply it just came back on. I’m super confused?? My MacBook pro Touch bar is became totally black, Only touch ID is working, nothing is showing in touch bar. I observer one thing is there is no customize touch bar option in the keyboard. there is no light nothing in the Touch Bar. Same issue on my macbook. Let me know if somebody had fixed this on Mojave. my macbook pro touch bar was unresponsive. also the command line tips did not work at all. restart over apple menue did also not work. only a hard turn off with pressing the power button did the trick for me. saved all open data before.